For many years I've made a laundry soap. It's a bar that holds a special spot in my heart. The reason? I named it after my Grandmother Marie Jentsch who also enjoyed making soap. Here's a photo of us from long ago - 20+ years. My dad and I are on the ends. My Grandma Marie is holding my daughter Caitlin Marie who, at age 12, suggested to me that I should make soap. Amazing... but that's a story for another time. I've heard stories from my dad and his sisters about Grandma making soap, although I was never able to ask her about the soap making process. I started the craft after she was gone. I do know that she would have loved that I am a soap maker like herself! A while ago I was given Grandma's scrapbook of recipes that she collected over many years. Many of the recipes are in her handwriting, others are clipped from booklets and newspapers, some dating from the 1940's. I treasure these recipes and love looking over them, imagining a story for each of them. I wonder to myself, was it early one morning as she was sipping coffee that a recipe caught her eye enough for her to cut it out and paste it into the book for safe keeping. Or perhaps, she was thinking about my dad and his sisters, and wondering about making something special for them. The book is fragile and so I gently turn the pages. Twice, I discover, she has clipped out and saved recipes for homemade lye soap! The old-fashioned laundry bar I've named after my grandma, is adapted from several old recipes and is excellent at removing stains. Lately, for my own use, I've been making a batch of laundry powder which includes ground soap from the laundry bar along with other ingredients. 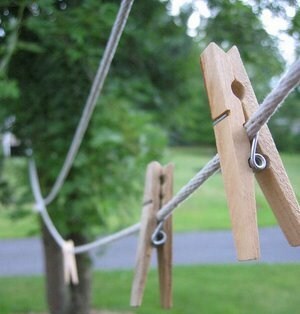 Here's how I make my own laundry powder. First I grate our laundry bar on a cheese grater. Grate enough flakes to measure 1 cup. Then add 1 cup washing soda, 1-1/2 cups borax and 1 cup baking soda. I combine all the ingredients into my food processor and mix until powdered. I use 1/4 cup per load of laundry. This recipe is very inexpensive and I have found it to work really well. 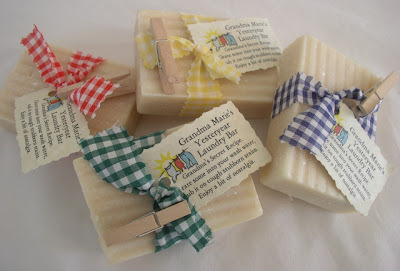 Grandma Marie's Yesteryear Laundry Bars can be found on the 'Special Purpose Soap' page of our website.